E 55-210mm f/4.5-6.3 OSS Lens (Black) is rated 4.4 out of 5 by 238. Rated 4 out of 5 by shermdog from Good value for the money I bought this lens to pair with a Sony a5100 and I have not been disappointed. The pictures I have taken are clear with good detail throughout its entire focal length. It's certainly not the most impressive zoom lens around, but for the money, it's an excellent performer and good value. Despite it's size, it is still manageable on the a5100. Autofocus works very well on this lens, though it will hunt a bit at the long end in low light. OSS is excellent, especially at the long end, and has allowed me to capture fantastic video. For video, it would be nice if this lens offered power zoom, but that's not really expected at this price point. Rated 3 out of 5 by Trotterjay from Decent long telephoto. Sony doesn't offer, as of yet, a hi-end long e-mount telephoto for their nex system. Because I like the compactness and autofocus capabilities of native lenses I bought this. It did not give me the color pop or contrast of other lenses like Sony's 10-18 ultra wide zoom, Zeiss 24 prime or Sony 50,1.8. Autofocus is slow. Don't expect to use this for sports or wildlife unless the subject is stationary. However, the images are reasonable. I'll continue to use this lens. Sharpness is pretty decent. I have also not experienced any lens creep. This has been a problem for others but not me. Maybe when it gets older it will occur. Easily fixed with a wide rubber band around the lens barrel. For the price they are charging it's a good value. Just don't have unreasonable expectations. Rated 5 out of 5 by Raine from Solid Lens I've been using this lens for a couple of months now and I've found it to be quite reliable as my go-to telephoto lens. I generally shoot in JPG so any lens distortion that may be present when shooting in RAW is next to non-existent for my copy. I don't notice any vignetting and very minimal chromatic aberration. My only qualm with this lens would have to be its tendency to hunt in low light situations, which could have probably been resolved with a faster f-stop (say a constant f/4.0 when zooming). However, switching to manual focus usually resolves this issue. Overall this is a very solid lens I've enjoyed using for a wide variety of shoots. I highly recommend this as a supplement to the Sony 16-50mm kit lens. Rated 5 out of 5 by Chuck in NM from Tremendous value, Surprisingly good This is the perfect lens to carry with your A6000 if you want something a little zoomy that doesn't weigh five pounds or break the bank. This lens does quite well, all things considered. Yes, it's a little slow so you need light or a tripod. It doesn't have the solid feel of Canon L glass or a Tokina AT-X Pro zoom. It's not a constant f/2.8. But consider the price point. It produces sharp images, the OIS really, really does wonders and the color and contrast are nice. Raw images processed in Lightroom with the specific lens profile applied turn out very nice. Whereas I cannot recommend buying the 16-50 power zoom as it's a real dog, I can definitely recommend this lens. It's truly a no-brainer. For the price, it's an overachiever. 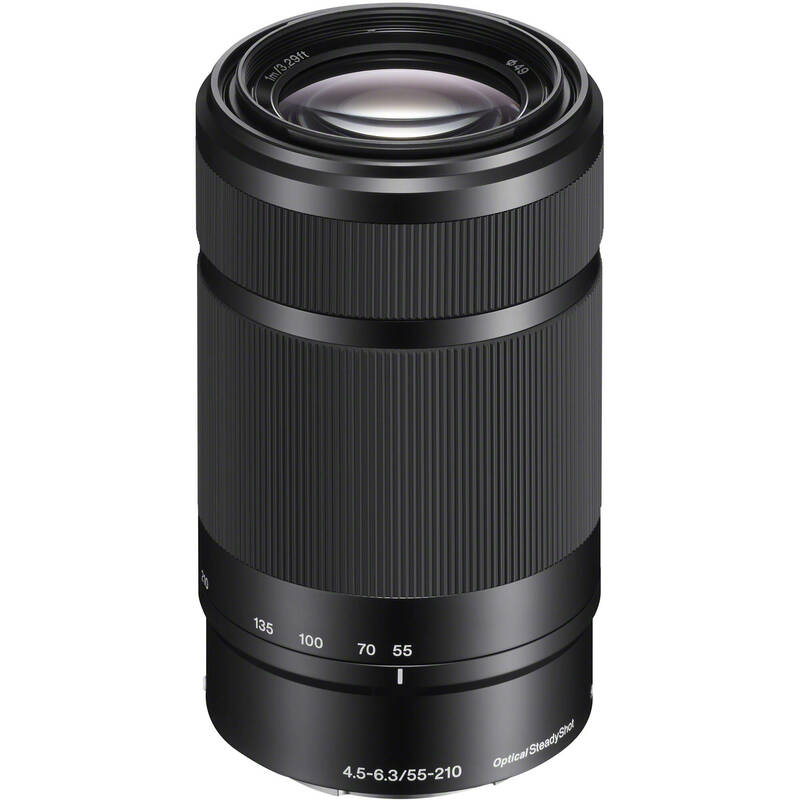 Rated 5 out of 5 by John from Under-rated In my opinion, this is one of the best value Sony lenses you can buy for any of Sony's systems, let alone just e-mount. Some of the sharpest shots I've taken I took with this thing. It performs WAY better than the dxo ratings, in my opinion. I've spend more money on a lot of other lenses that performed the same if not marginally inferior. The biggest thing I've learned about lenses over the years is that you really can't really on ratings. You have to try them. So you might as well start with a budget lens first. This sucker is one of the best. Fantastic bokeh at all focal lengths. Sharp as a tack when settings are correct. Performs well on automatic too. Probably the best package lens I've ever tried (comes with the combo). Color rendering is superb also. Highly recommended. Rated 4 out of 5 by Tony from Great Little Lens this is a great little lens: very sharp, excellent contrast and small considering the zoom range. Easily fits in your pocket. OSS is very effective and one can easily hand hold at 1/8 second on the short end and 1/20 on the long. Only reason it doesn't get 5 stars is because of the plastic lens flange. I'm sure Sony will say that the plastic is stronger and more accurate than the metal but I still like metal. Call me old fashioned. If you are looking for an indoor, low light lens this isn't it. If you are looking for a good all around tele zoom then you can't go wrong. Rated 4 out of 5 by SteveH from Worth the price I'm still getting used to my a6000 and the new lens but I try and take it everywhere to get some experience using the lens. I do notice some pictures are crystal clear and others are a little soft. At this point I'm not sure it's the focus or the lens. But the pictures that are clear come out with fine detail even zooming in 150% I have a Tamron SP 60-300 and 28-80 and have had hot and miss success with them also so I think it is focus. I need to play around with the AF settings to see which best works for me. But about ready to travel to Iceland where light shouldn't be a problem so that will be the real test. does this lens fit a sony alpha 5000? As the Sony Alpha a5000 Mirrorless Digital Camera and the Sony E 55-210mm f/4.5-6.3 OSS E-Mount Lens both use the Sony E-mount lens mount, yes, the Sony E 55-210mm f/4.5-6.3 OSS E-Mount Lens is compatible for use with the a5000 DSLR camera. The Sony E 50mm f/1.8 OSS lens would be a good choice for the A6000. Can this lense be manually focused? Can we use a tele-converter with this lens? If so which is preferable? Can I use the Sony 1.4x Teleconverter Lens SAL14TC? Unfortunately, teleconverters are not compatible with lenses with a focal length shorter than 70mm. Sorry, do not know the answer. Suggest, you contact the manufacturer. Does it fit a 7 ii? Will it work on an FS-700? If the FS-700 (?) accepts E-mount lenses. I don't know if there are camera brands other than Sony that will accept E-mount lenses?